You will earn 1,240 Reward Points. Earn 1 reward point for every 1 dollar spent. Cook a large volume of two liquid menu items at a time with the Blue Air BFSP-18-2B Stock Pot Range! This reliable piece of equipment will easily boost your cooking production without taking up too much space. This 50.2" long unit comes with a stainless steel front, sides, and legs to provide the solid weight support you need for two large pots filled with water, stock, or whatever liquid food item you need for your menu. Plus, this durable construction is easy to keep clean and will not easily dent, rust, or scratch, so you have a low-maintenance unit that can endure years of heavy use. 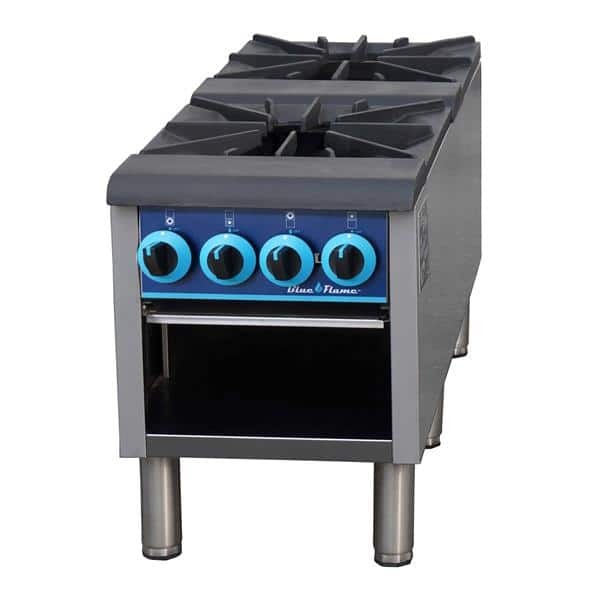 The Blue Air BFSP-18-2B Stock Pot Range comes with two burners each with two rings that produce a total of 160,000 BTU. The burners are concealed behind 17.5" heavy-duty cast-iron grates that won’t easily chip or break, making them perfect for handling massive stock pots. Each burner ring comes has its own infinite control knob, so you can find the precise temperature and cooking power you need to perfect your sauces, stews, chilis, and more. The Blue Air BFSP-18-2B Stock Pot Range comes with a standing pilot ignition system that immediately turns out without any electricity required. This model uses natural gas, but you can easily switch to liquid propane with the conversion kit included in your purchase. The legs also keep the stock pot range stable on your kitchen floor. You can adjust them from 6-8” for any clearance or height requirements you may have. The Blue Air BFSP-18-2B Stock Pot Range holds a CSA-Sanitation certification as a mark of safety and performance excellence.